A medieval stroll along the road should always involve booting a few magic chests and this is clearly the inspiration behind Holy Diver, an online slot from Big Time Gaming with a clever way to trigger the features – keep reading to find out how it all works. Holy Diver is a six reel slot with variable rows and a potential 586,971 paylines – this gigantic number is made possible because of the varying sizes of symbol on the reels, the smaller they are the more ways to win. Beneath those reels our knight walks along the path as the reels spin, encountering regular treasure chests. Rectangular gems in purple, red, blue and green are the high value symbols while 9, 10, J, Q, K and A are the lower values. There are no wild, scatter or bonus symbols in the base game but, as you’ll see shortly, we don’t need them! Standard Symbol Bonus – reveals one of the lower value symbols which will all turn wild on the reels. Sword Bonus – up to three wilds turn completely wild with a multiplier of up to 7x. Fireball Bonus – adds several wild symbols to the reels. 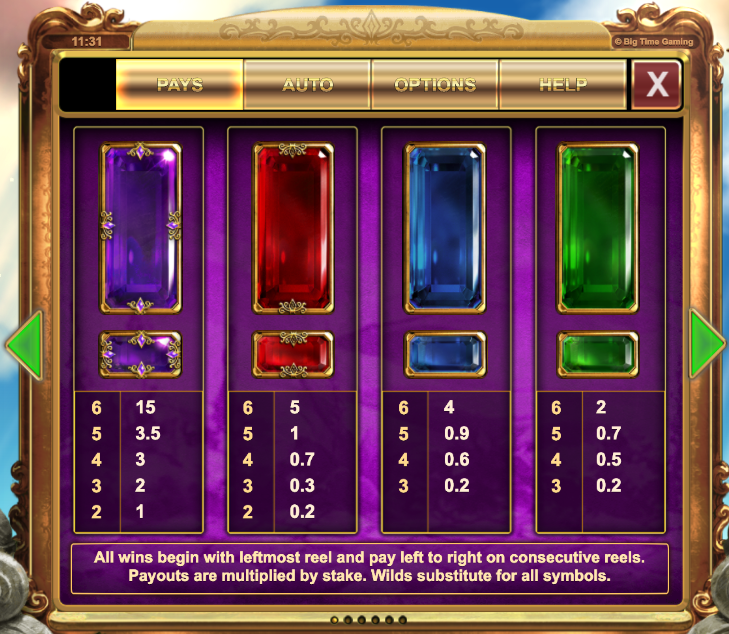 Gem Symbol Bonus – reveals one of the higher value symbols which will all become wild on the reels. If you’ve reached level two or three there’s also a multiplier attached of 2x or 3x respectively. Finding gems in the chests will also add them to the shield on the left hand side and once the shield is full the player can choose to level up or play the free spins round. There are only three levels so once you’ve reached level three the spins are awarded automatically. 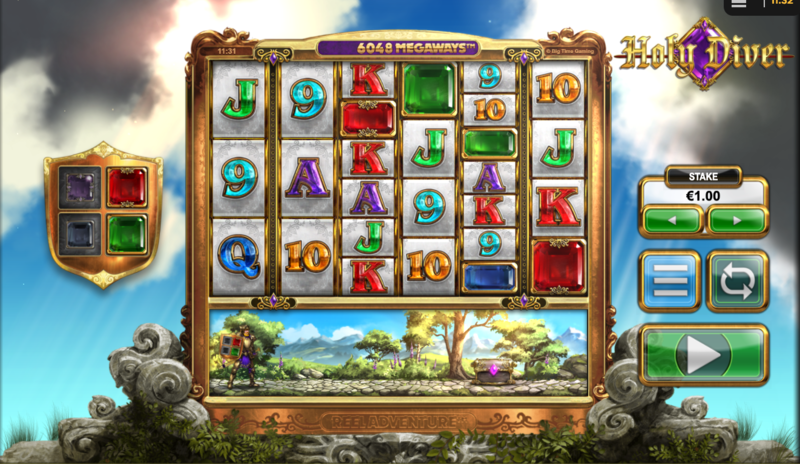 You’ll get ten free spins with all gems on reels two to five turning wild with win multipliers of 2x or 3x if you’ve reached levels two or three. The knight collects diamonds by slashing at hooded figures during the free spins – the first four award an extra spin each, the fifth awards eight extra spins and adds more symbols to the reels. Holy Diver is innovative, clever and, most importantly, enjoyable so this is a slot not to be missed if you’re looking for something a little different; reach level three and you’ll be playing with a massive 586,971 paylines.